In our Yaakov Spellman Early Learning Program (N-PK), children learn through play. We believe that play is the foundation for all learning for young children. Playing allows children to unlock their creativity and imagination, and develops a myriad of valuable skills, such as reading, thinking, language, teamwork and problem-solving. Our program combines open-ended play and teacher-directed activities, with ample time outdoors. 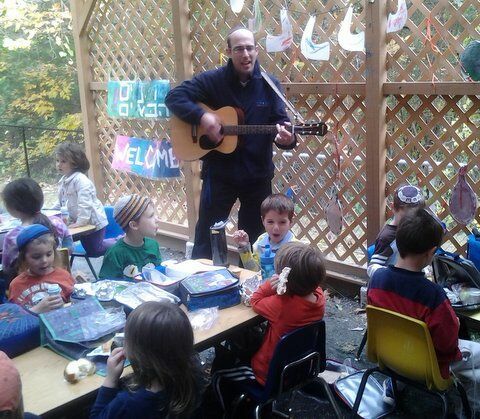 Music, science, gym, cooking, art/nature and Shabbat/Israel are incorporated into the curriculum each week. Our curriculum is designed so that children gain key foundational skills within all of the developmental areas. We work on building cognitive skills in pre-literacy, math and science. We work on developing motor skills - strengthening both fine motor and gross motor control on the playground and in our classroom. We focus on refining speech and language skills by modeling both Hebrew and English language when reading books, singing songs, telling stories and using the flannel board. Our hope is to build each child's self-confidence and self-esteem as they learn to be part of a community - within the N-PK classroom and within the whole school. Our love of Israel is an integral part of who we are. We share our love of Israel through Parshat HaShavua (the weekly Torah portion), tefilla (prayer), Hebrew language, Shabbat and chagim (Jewish holidays). We hope to enhance each child's Jewish identity as we build a lasting bond and connection with Klal Yisrael, the Jewish people.